Cycles of innovation on the Web happen rapidly, and even Yahoo fans might concede that the company has failed to keep pace with change. That’s contributed to its well-publicized recent woes. Now the company is being forced to reinvent itself by doing more to appeal to developers and embedding social networking features in its heavily-trafficked Web services. The latest phase of that transition is an extension of its Yahoo Open Strategy (YOS) to some of its most popular Web properties, including My Yahoo, Yahoo Mail, Yahoo Toolbar, and across the company’s media Web sites. Mostly notably, today Yahoo announced an upgrade to Yahoo Mail that serves up information that might be of interest to subscribers. 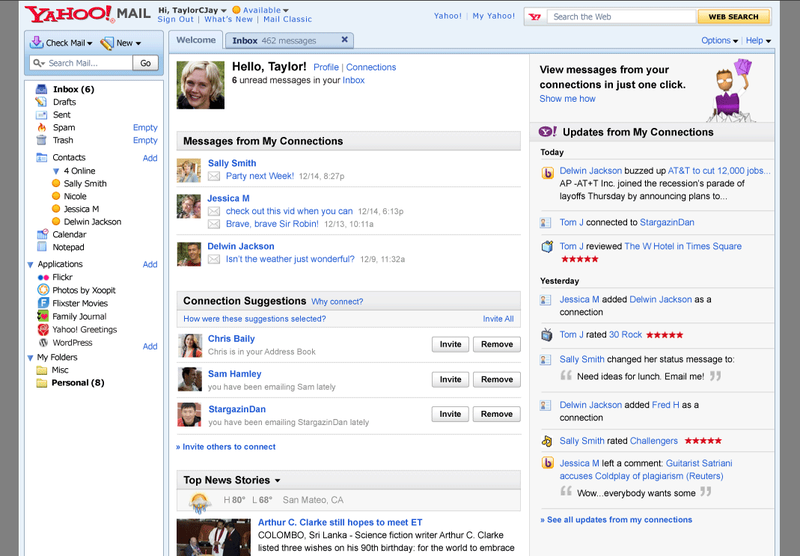 The Mail site now resembles an e-mail inbox with elements of Facebook; applications and notifications surround e-mails. It keeps people in touch and looped in at a glance. Yahoo is offering six initial Web services, including ones from third parties: Family Journal, Flixster Movies, Flickr, Photos by Xoopit, WordPress, and Yahoo Greetings. The company said in its blog that it is working to safeguard the sensitivity of users’ personal e-mail, and it will refine its application security model before opening the door to developers. When I think of how much of my day is spent on Facebook (more than I care to admit), it makes perfect sense to follow that model. I usually have two separate browser windows open: one for Facebook and one for Gmail. Combining that functionality makes perfect sense–it’s just a shame that Yahoo had to be prodded to do it. The Yahoo home page now has an applications sidebar that is open to third party developers, and the company has published a new theme API. Notifications about contacts’ activities across Yahoo Web properties is displayed when the user is logged in. Some notifications are pulled from Yahoo TV and Yahoo Music. Yahoo announced its YOS strategy in October, and introduced its development platform, including Yahoo Application Platform (YAP), Yahoo Social Platform (YSP), and Yahoo Query Language (YQL), at that time. From the looks of what it has accomplished to date, Yahoo should manage to stop the hemorrhaging and retain many of its millions of users. It may even attract some new ones. I cannot wait to see more of this superior topic. So much of it Ive never even acknowledged. You sure did put a fresh twist on something that Ive heard a whole lot about. I dont believe Ive actually read any scenario that does this subject nearly as good justice as you just simply did.